Article: It’s Time To “Rock Your Hot Mess” With Brooke Lewis And Alison Cohen’s Fantastic, Trucker Hat – Get Yours Today! She’s a sensational actress, a brilliant author, a life / dating coach and a fashion queen – is there anything that the phenomenal Brooke Lewis can’t do?! It’s clear to see that Brooke Lewis is one of the most prolific and admirable ladies on this planet. Whatever venture she takes on, she does it with such grace, elegance and a whole lot of girl power. From on-screen projects, to clothing lines, an award-winning book, and even a makeup collection, Brooke Lewis is definitely creating one exceptional empire with one amazing message – to rock your hot mess! Now, the terrific, dynamic duo – Brooke Lewis and Alison “MetalBabe” Cohen are bringing out a spectacular, new item from their “Rock Your Hot Mess” Collection – a fantastic, trucker hat! This excellent hat is perfect to rock anywhere and everywhere – whether you’re about to enjoy a fun, beach day, going to the gym, going to spend a day at an amusement park, and whenever you’re running around town. Plus, all of Brooke Lewis and Alison “MetalBabe” Cohen’s items emphasize the importance of how we all are “perfectly, imperfect” and it’s a wonderful thing to embrace our hot mess and rock it! 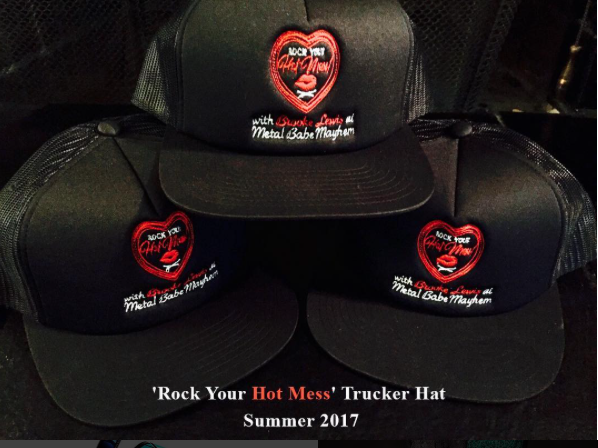 The “Rock Your Hot Mess” trucker hat is definitely something we all need to get our hands on! It’s perfect for the summertime and it’s totally a must-have. You can get your own “Rock Your Hot Mess” trucker hat here and if you want to purchase more items from the “Rock Your Hot Mess” clothing line, be sure to get your shop on at this link. Here at Alexisjoyvipaccess.com, I’d like to send a big congratulations to Brooke Lewis and Alison “MetalBabe” Cohen on their excellent, trucker hat collection! They are two #BossLadies who are totally taking over the entertainment world by storm. Next VIPAccessEXCLUSIVE: Aidan Miner Interview With Alexisjoyvipaccess At “The Thundermans” 100th Episode Party!